The River Region United Way's annual fundraising campaign got some fuel for its race to the finish this week, thanks to Hyundai. 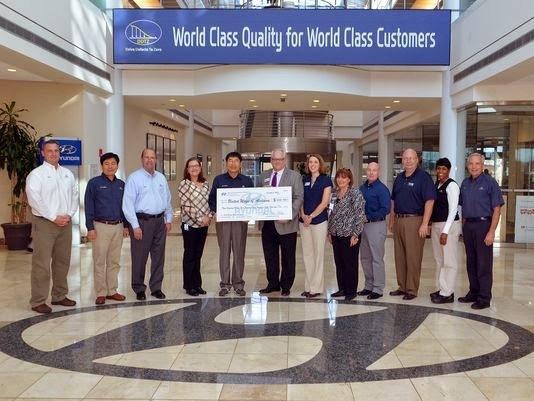 Hyundai Motor Manufacturing Alabama and workers at the plant in Montgomery donated $335,954 to area United Way agencies. Employees pledged more than $270,500, and the company added $65,000. The total donation was the most HMMA has ever given to the United Ways of Alabama. The company and its workers have donated each year since 2006. "I am proud to be part of a team that gives endlessly to families and need and to work for a company that also supports our communities and those in need," said Yvette Gilkey-Shuford, co-chair of the company's campaign. They presented to the donation Tuesday to representatives from United Way offices throughout the River Region. The River Region United Way passed 70 percent of its $5.2 million fundraising goal this week. The campaign ends Dec. 31. "People think this is a year-round campaign," campaign manager Alicia Schneider said. "It's not. We essentially have three and a half months to raise $5.2 million." The money funds more than 40 agencies that serve nearly 135,000 people in Autauga, Elmore, Lowndes, Macon and Montgomery counties every year.